Located in the Ace Hotel, The Breslin is an oasis in the middle of that sketchy wholesale area between Flatiron and Herald Square. When you first walk in, you are greeted by an upscale funky pub vibe. 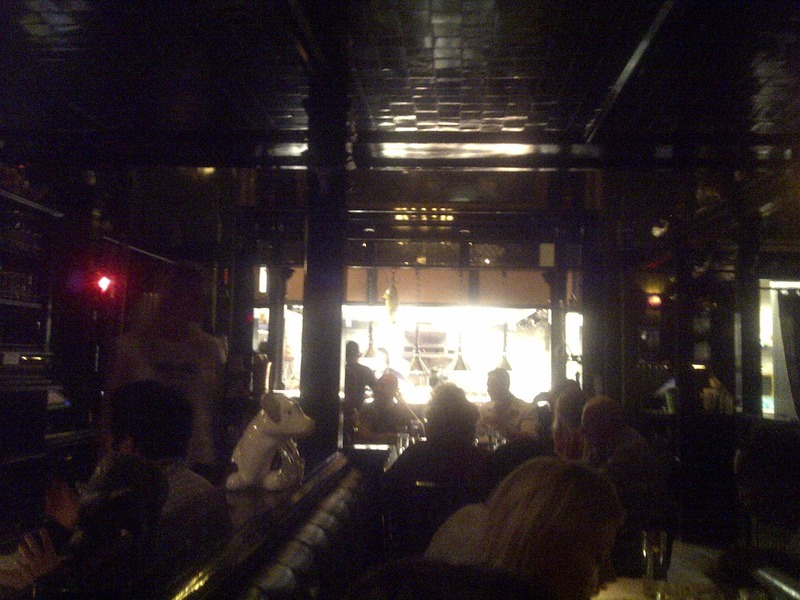 It's very similar to Otto's bar area where there are a couple tall tables for you to stand around with a drink or two. The Breslin is a pretty popular after work spot so come early or be prepared to join the ranks in the bar area while waiting for your table (about an hour for me on a Thursday evening). When you are seated in the dining area in the back, you'll notice all the wood and fun animal decorations. Its almost like...a farmhouse? No that doesn't seem to be the right way to describe it - best to check it out yourself! Looking at the menu, The Breslin has lots of drink choices including original cocktails (which is always a plus for me in my book!) and beers. 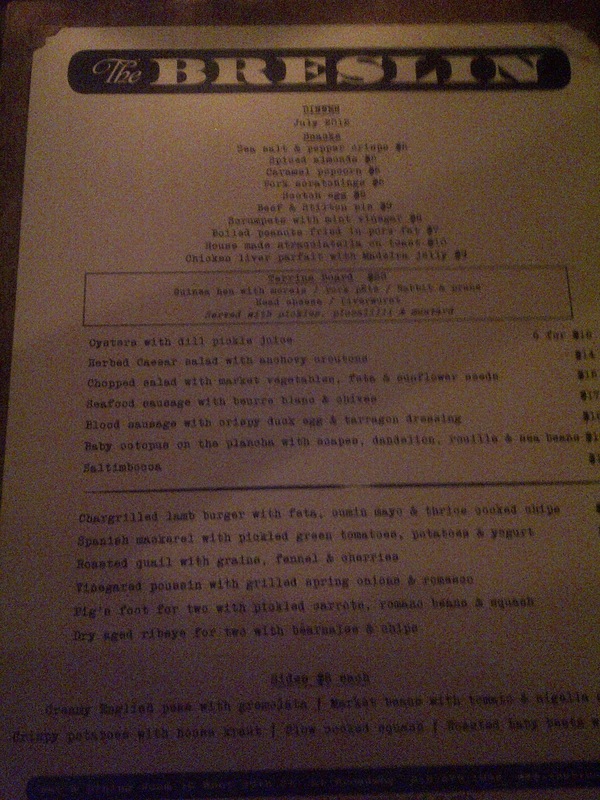 The food menu, however, is actually pretty limited. 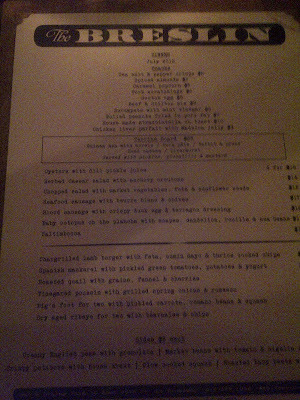 Its really meat centered and there is no safe dish - The Breslin is definitely for the adventurous (and carnivorous) eater! 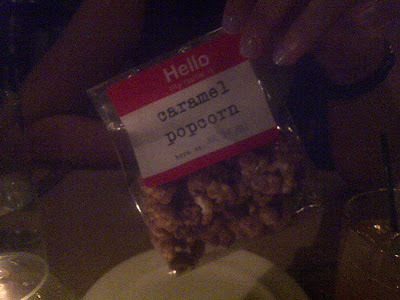 To start, dining compadre and I went with the Caramel Popcorn and the Scotch Egg. The Caramel Popcorn came in this cute bag with a "Hello my name is Caramel Popcorn" sticker. Sadly, the bag was very small. Even sadder, I thought the popcorn was meh (is it terrible that I prefer Cracker Jack and/or Poppycock?). Save your $5 and put that towards another drink. 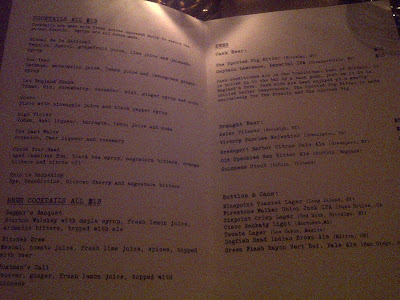 The Scotch Egg, however, was excellent! Yes, you only get ONE egg with your order (that is correct - for $8 you only get one egg!) but this is one magnificent egg! 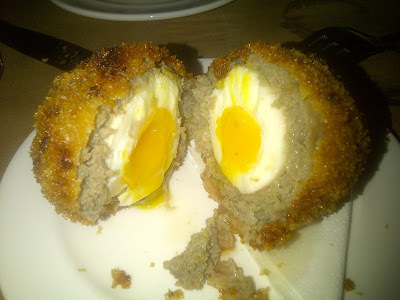 If you've never tried this before, a Scotch Egg is a hard-boiled egg wrapped in sausage and then deep fried. This came out to our table hot fresh and crispy! You cut it in half and see each layer clearly with the yolk still soft and slightly runny. This was promptly devoured by dining compadre and me. Fabulous fabulous fabulous Scotch Egg! As for the mains, dining compadre couldn't resist the call of the famous Lamb Burger and I went with the Seafood Sausage with a side of the Crispy Potatoes. 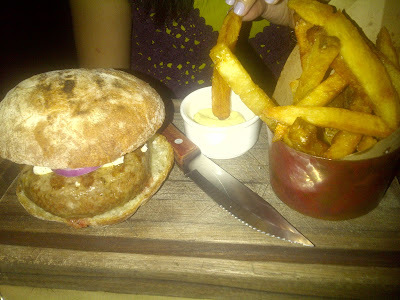 Lamb burger came on a wooden chopping board and was served with feta cheese, cumin mayo, and fries. Dining compadre said it was tasty and feta cheese went well with the burger. Towards the end, though, the juices from the thick lamb patty soaked through the bread and made the bun soggy. 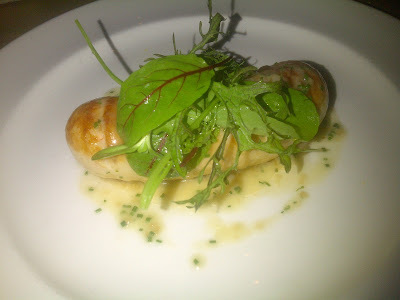 My seafood sausage (really? just one?? girl needs to eat...) was definitely an interesting eat. It was a white sausage with filling made from a puree/mousse of seafood. Wonderful flavor and definitely could tell it was seafood based. Sad that it was just one sausage though. Not only did it look kind of lonely on the plate, but I also had to eat super slow to maintain pace with dining compadre. 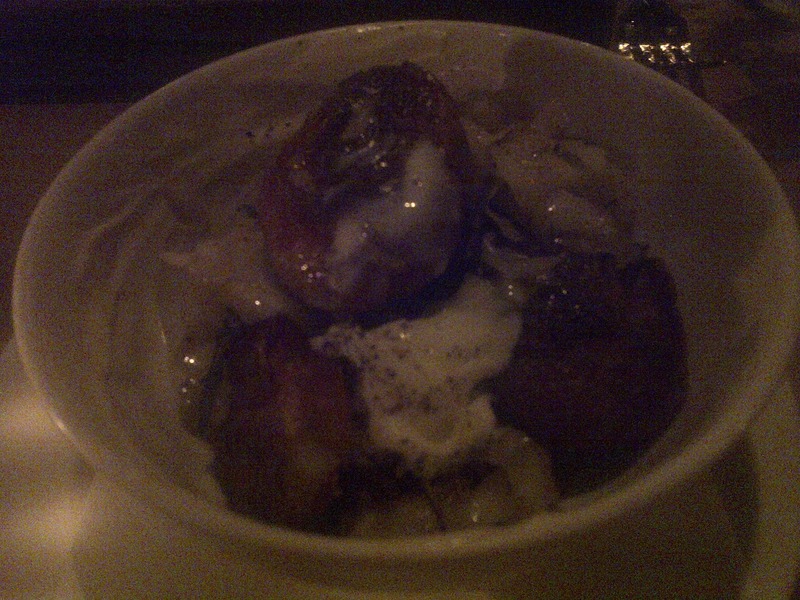 Thank goodness for the crispy potatoes for me to munch on! All in all, The Breslin is a nice casual dining spot where quality and presentation are not compromised. However, given the meat focused adventurous menu, this is not the place for everyone. I had a difficult time finding something to eat (and was disappointed by some of the portion sizes) so make sure to scope out the menu first before you stop by. And if you are still up for some after-dinner cocktails, stop by the Ace Hotel lobby next door for a drink - that place is definitely something you don't want to miss! Spotted: Another LadyM location coming soon!